Students at Our Lady of Port Richmond School in Philadelphia recently set aside their books for a lesson in the most difficult subject of all: life. 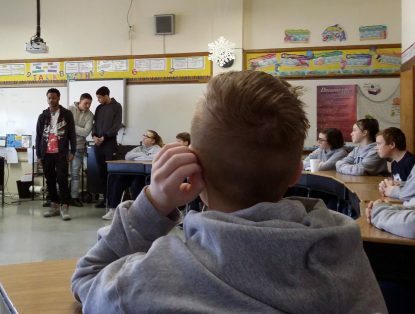 On Feb. 14, the school’s eighth-grade class hosted a presentation by three members of the Peer Council program at De La Salle Vocational, the day treatment center of St. Gabriel’s System in the Archdiocese of Philadelphia. A division of Catholic Social Services, the system offers educational, vocational and behavioral support to adjudicated young men aged 16 to 18. Opened in 1974, the Bensalem-based De La Salle school instructs approximately 300 youths each year, conferring high school diplomas and vocational certifications. The Peer Council program brings De La Salle youth into area classrooms to share their stories with students. Fred Trainer, a teacher and counselor at De La Salle, moderates the sessions, encouraging the students to analyze the speakers’ experiences and to apply the lessons learned to their own lives. Many of the Peer Council speakers struggled with poverty, traumatic loss and substance abuse before they entered De La Salle. After his father died of cancer, 17-year-old Eric began living on the streets. With his mother addicted to drugs and the family at risk for eviction, he started cutting school, getting high and dealing drugs to feed himself. Twice arrested, he found himself facing almost a year in prison. Eventually adjudicated to De La Salle, Eric now welcomes the chance to help teens make life-affirming choices. “I’m really excited to tell people about my experience, so they can hopefully not walk in the shoes I did,” he said. During the Peer Council sessions, Trainer focuses on “emotional intelligence,” which emphasizes self-reflection through which feelings can be effectively understood and managed, resulting in healthier behavior. At the Feb. 14 session Trainer used a sponge soaked in water to demonstrate how negative emotions can overwhelm a person, “saturating” the heart so that it cannot absorb further stress. Students were asked to suggest constructive ways of releasing pent-up feelings, such as talking to loved ones, participating in sports and praying. Trainer also explored the impact of peer pressure, challenging the students to remain steadfast in virtue when others around them make destructive choices. He observed that teens are particularly susceptible to impulsive decisions since the adolescent brain’s frontal cortex, which controls reasoning, does not fully mature until well into adulthood. Now in its 20th year, De La Salle’s Peer Council program serves a number of Catholic and public schools, as well as several colleges. The speakers share their stories with approximately 500 eighth-graders and 150 university students annually. The council members also participate in the Philadelphia Police Department’s training program, sensitizing cadets to the challenges encountered by troubled youth. To date, the Peer Council has worked with over 300 police officers. Trainer was inspired to start the Peer Council while attending a youth workshop in the late 1970s at Camp Neumann, a Bucks County campground operated by the Philadelphia Archdiocese from 1965 until 2005. At the workshop, a young man opened up about his struggles, deeply touching the other participants. Trainer immediately recognized the power of personal narrative to transform lives, and developed a men’s group at De La Salle that enabled members to share their own stories. For 17-year-old Ray, having a safe environment in which to assess his troubled situation was a turning point. The third member of the group visiting the Port Richmond Catholic school, Ruiz, has battled substance abuse and a violent temper. He urged students to adopt a broader perspective in their lives. Nuncio Davidson, a student at Our Lady of Port Richmond, took this advice to heart. 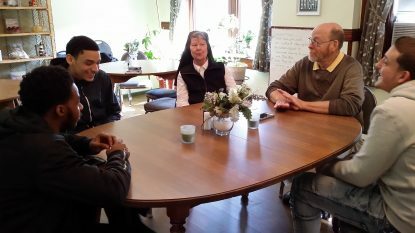 After the Feb. 14 presentation, Trainer and the three Peer Council members headed to the city’s Kensington section, sharing lunch and a message of hope with several homeless individuals.